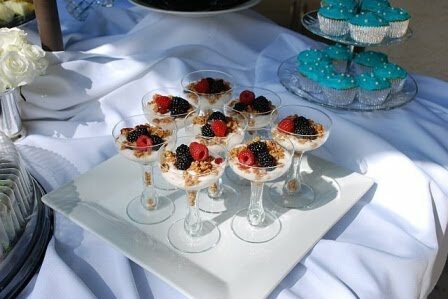 A previous client of mine (I hosted her daughter's Tinkerbell party last September) saw pictures of the Breakfast at Tiffany's party my friends and I hosted for Suzanne's 50th birthday. She asked me to do the same for her friend's 40th birthday. 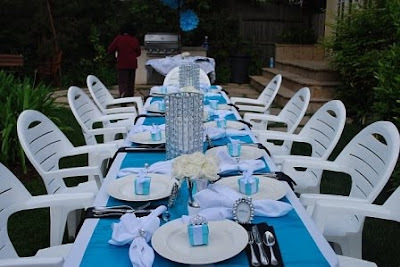 I used white tablecloths with blue satin runners to highlight the white plates. 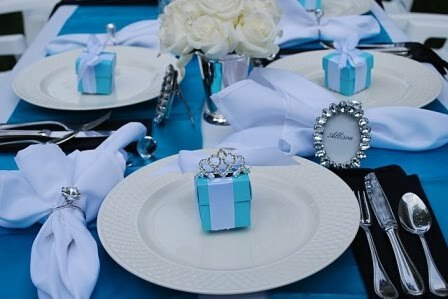 The napkin rings were giant diamond rings and the placecard holders were mini crystal frames. I also had long black gloves for the utensils and for the guests to have fun pretending and their were white roses in silver mint julep cups. 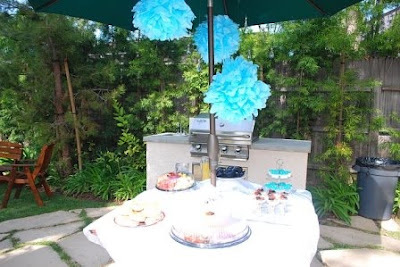 I used tissue pom poms from Pom Love and hung individual crystals over the food table. The hostess made these yummy fruit and granola parfaits and the adorable cupcakes. 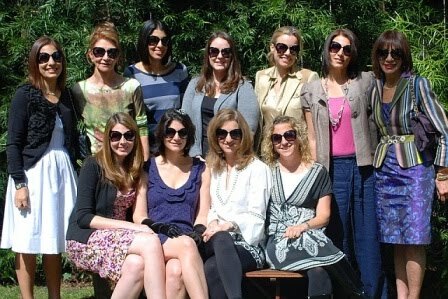 I gave all of the guests Audrey inspired sunglasses as party favors. The birthday girl received a tiara and everyone had mini Tiffany inspired boxes filled with Hershey Kisses on their plate. Happy Birthday Allison! I did a similar party....sooo fun!! Oh Donna, this is so cute. Where in the world did you find the boxes and are those small tiearas? How clever. I want this for my birthday! P.S. How was it sleeping with the fish? what a fun party theme-love it! gorgeous! I simply LOVE that color blue!! One of my favorite books/movies of all time! I love this. Great job incorporating that Tiffany blue! So lovely! You can't go wrong with a Breakfast at Tiffany's theme!! :) Great job! I so love the theme of the birthday! I wish I could have one like this for my birthday too! I LOVE this theme! You did a BEAUTIFUL job pulling everything together! So creative! Hi Donna, I just saw the cute photos of your kiddos on FB....I do believe they looked like they were having a whole lot of fun, plus they were darling! Love Chasen's cast design! :) Was that YOU or HIM who came up with that? I know your summer plans will be busy now that the kiddos are nearly out of school, I also know you will have fun with them. I miss our "old days" of blogging and visiting. Life just gets so busy...and FB is way faster. You know how to PARTY Donna! I need to party more! Thanks for your inspiration! emailed you about the chandeliers!